Whether on a local, regional, state or national level, when students attend a SkillsUSA conference or training event, they are stepping out of the bounds of comfort and expanding their horizons. SkillsUSA offers rich and meaningful opportunities for students to connect attending such activities with the development of the framework skills of personal, workplace and technical skills grounded in academics. By participating in the activities outlined below, SkillsUSA chapters become conduits for meaningful student growth..
SkillsUSA offers advanced training for students and advisors that focuses on professionalism, communication and leadership skills. This training is held in Washington, D.C., and allows members the opportunity to share their SkillsUSA and career and technical experiences with elected officials. Members of SkillsUSA who are committed to the developing their leadership potential. Interested students need to apply with their state association directors. Applicants must articulate their leadership commitment by submitting information on previous experiences and leadership training. 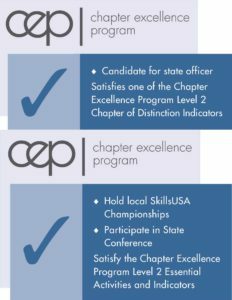 Prepare your state officers for a year devoted to leading your association and increasing member engagement. Leverage is an intensive, two-and-a-half-day leadership experience open to SkillsUSA’s state officers and focuses on developing the following framework skills: leadership, professionalism and professional development. It provides state officers with high-energy leadership training that focuses on individual leadership skill development, building teams and communicating effectively. Count on Leverage to have a lasting impact on your state officer team. Through workshops, self-assessments and working as teams, students will be led through a model of “me, we, do” in relation to implementing the four pillars of leadership in their personal lives and by service to their state association. State officers will develop the skills needed to facilitate student learning: how to set context, give directions and debrief the experience. State officer teams are important to the success of the organization. What the officers do and how they do it can have a significant impact — not only on the image and essence of SkillsUSA, but also on career and technical education. Activate is a two-and-a-half-day leadership conference that will help SkillsUSA members find their “start button” through hands-on, high-energy and motivational programming. Activate is open to all SkillsUSA student leaders and focuses on developing the following framework skills: leadership, communication and team work. During the course of the conference, chapter leaders will discover how to ignite the leader in them and maximize their potential. Participants will spend time working together in a project management atmosphere. Collectively, they will learn to work as a team to set and accomplish goals. They will take a look at what it means to present a positive image — and the effects that image can have not only on themselves, but also on their school, SkillsUSA, and career and technical education. Engage is a professional development training conference designed to help teachers better understand and use leadership development materials and interactive resources available through SkillsUSA. Teachers will help their chapters grow through the latest information and tools in classroom management, student motivation, employability, leadership development and teaching strategies. The two-and-one-half-day program is taught by experts within youth leadership development as well as by guest presenters. Advisors will discover how to use SkillsUSA as an educational teaching strategy and an integral component of any career and technical education program. Teachers will gain the latest techniques involved in giving clear directions, questions, processing and accessing student achievement. Answers will be revealed on how to successfully engage students in chapter meetings, committees, recruitment, fundraising, public relations and the entire program of work. Participants will unpack resources and share best practices on how to implement these tools for the greatest impact in their SkillsUSA chapters. Teachers participating in Engage will receive educational resources as a part of the training. TAG Tuesday leads conference delegates on a quest to “Train, Act, Grow” (TAG) from their leadership experiences. It helps students engage more, give more and be better delegates for their state associations. Training for middle-school and high-school delegates builds on servant leadership, member recruitment and creating an atmosphere of teamwork. College/postsecondary delegates will focus on skills to kick-start their careers: successful networking, marketing themselves, interviewing skills and creating personal and professional success. Training concludes with live interviews with business leaders who offer feedback on résumés and interviewing techniques. Being an officer is one of the highest honors and most rewarding experiences a SkillsUSA student can achieve. Do you know a student dedicated to SkillsUSA? Does that student possess excellent communications skills such as public speaking (or is at least willing to learn)? Does he or she display professionalism, work well as part of a team and act appropriately in many different situations? If you answered yes to these questions about any of your students, then consider having him or her run for a local, state or national office. Before urging a student to run for an office, be sure he or she is doing it for the right reasons. Yes, it can lead to a great title and some travel and can look good on a résumé, but holding an office means the student agrees to take on certain responsibilities and to represent the organization. The SkillsUSA Championships begin at the local level with contests in classrooms nationwide. Winners advance through district, regional and state competition, and only the best make it to the national event. State and local competitions and conferences are managed at the state level, not by the national organization. Students benefit no matter how they place in their contests. The philosophy of the championships is to reward students for excellence, to involve industry in directly evaluating student performance and to keep training relevant to employers’ needs. Students test their skills, frequently make job contacts, and have a chance for recognition. State and national winners receive gold, silver and bronze medallions, scholarships, tools and other awards. The SkillsUSA Championships event takes place in Louisville, Ky., in June 2019 and requires more than 1 million square feet of floor space, with more than 6,500 competitors in 102 different events. Business and industry contributes more than $36 million in equipment, supplies and personnel to support the SkillsUSA Championships, which is considered the largest single-day commitment of corporate volunteerism in America. The SkillsUSA Championships brings together industry and labor representatives, educators and the public to watch students compete in leadership and hands-on skill events for a full day. Every other year, a select few are chosen to compete on an international level in the WorldSkills Competition. The 2019 SkillsUSA Championships Technical Standards is the official competition guide for the SkillsUSA Championships. It contains rules for all national events, including an overview, lists of technical skills and knowledge required, clothing requirements, eligibility and equipment lists. It also lists the embedded academic skills in math, English and science. Rules for state and local events may vary from the national guidelines, but most competitive events are modeled after the national technical standards. As a free member benefit, SkillsUSA professional members receive the 2019 SkillsUSA Championships Technical Standards when they have submitted a current and accurate email address along with their membership details. The 2019 SkillsUSA Championships Technical Standards is available online only to professional members as part of their paid membership.